Our tub-to-shower conversion service begins with a consultation with one of our designers who will help you choose the wall surrounds, showerhead, and storage fixtures that will revitalize your bathroom with your personal touch. No matter how you design your new shower, it will feature a low or no basin wall for easy access, conveniently placed grab bars to help you maintain your balance, and the only true slip-resistant shower floor in the industry to minimize the risk of a slip and fall. And, we’ll include a shower chair for your comfort at no additional cost – most bathroom remodeling contractors in Austin, TX, charge extra for this feature. 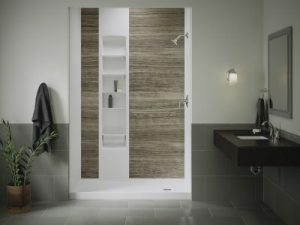 The walk-in tubs that Safe Showers installs include the same great safety features as our showers, plus one additional feature that most homeowners long for in a bathtub: soothing hydrotherapy jets. Your aching muscles will find sweet relief as you bask in your own personal spa. At Safe Showers, not only do we offer the lowest prices for the highest-quality safe-bathing fixtures in the area, we also provide timely turnarounds. That’s because we stock most of our products in our showroom, eliminating the wait for them to be shipped by the manufacturer. And, with our one-year labor warranty, you know your investment will be protected. Find out for yourself how we stand apart from other bathroom remodeling contractors serving the Austin, TX, area by contacting Safe Showers today. We look forward to making your bathroom safer for you and your loved ones with a walk-in shower or tub.